Following on from the announcement that Anglian are sponsoring Norwich City again this season the blog team will bring you the very latest from the home of Norwich, Carrow Road. 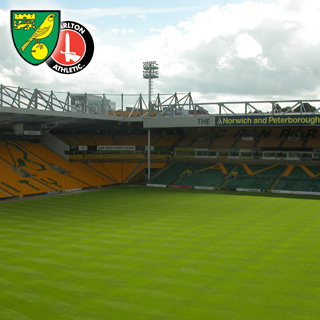 Below is the latest match report from Norwich’s match against Charlton this weekend. “A PULSATING clash at Carrow Road saw the battling Canaries claw back a two-goal deficit to share the spoils with Charlton and knock the Londoners off the top of the League One table. Goals from Wes Hoolahan and an injury-time equaliser from skipper Grant Holt earned City a gritty point after strikes from Deon Burton and Jonjo Shelvey had appeared to put the Addicks in a commanding position. The Canaries had already spurned two or three good opportunities when Deon Burton stooped to head home a Jonjo Shelvey corner against the run of play in the 18th minute. In a stormy first half with referee Steve Tanner in the thick of things with a couple of controversial decisions, Charlton doubled their lead when Shelvey headed home after good work from the dangerous Lloyd Sam on the right on 40 minutes. But City struck back a minute before the break as Wes Hoolahan celebrated his recall to the starting eleven by blasting home from Grant Holt’s quick throw-in to reduce the deficit and set up an exciting second half. After the break City carved out a number of chances but the closest they came to scoring in regulation time was a bouncing half-volley from the excellent Korey Smith in the 83rd minute which Rob Elliot in goal for Charlton palmed over brilliantly. Just as it looked like finishing a frustrating afternoon for the Norwich faithful they were sent into ecstasy, as sub Chris Martin’s deflected cross was met by the towering figure of Grant Holt and the ball spun in off his back in front of a delirious Barclay Stand. There was nearly a sensational City winner in the last action of the game as sub Cody McDonald hit an acrobatic overhead effort a yard wide. City boss Paul Lambert praised his side’s effort in overcoming a 2-0 deficit against the league leaders to secure a point with a 2-2 draw: “It was brilliant,” he said. “I don’t think we deserved to be a goal down in the first place. So effort-wise and the hunger and desire to come back from 2-0 against the team top of the league is absolutely fantastic. Anglian Home Improvements formerly known as Anglian Windows. Supporting local communities since 1966.